If you're fascinated by the life of Great Britain's Queen Victoria, family tree information about her ancestors and descendants can add to your understanding of this famous monarch. Knowing about these relationships can also help you see how this remarkable woman was related to past and current members of the royal family. One of the most influential women of the 19th century, Queen Victoria garnered the respect and admiration of people around the world. She reigned for more than 63 years. It's because of this woman that the last part of the 19th century is called the "Victorian era." 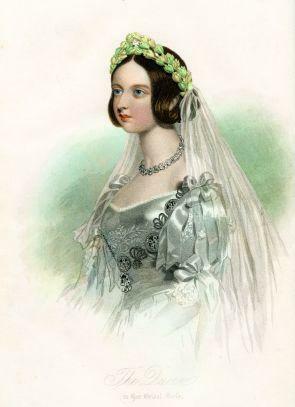 As a young woman, Queen Victoria married the German Prince Albert. Together, they had nine children and 42 grandchildren. Many of their descendents married members of other European ruling families, giving Queen Victoria a family tree that sparkles with royal titles. Princess Alexandrina Victoria was the only child of Victoria Saxe-Coburg and Edward, the Duke of Kent. Her father died when she was a toddler. Her mother, who was of German ancestry, raised her from that time forward. Both of Victoria's parents were of royal ancestry in Germany and England. Queen Victoria and Prince Albert had five daughters and four sons, all of whom survived until adulthood. Many of Queen Victoria's children went on to marry into other royal families and have many children of their own. Victoria, born in 1840, was the Princess Royal and married King William I of Prussia. Edward, born in 1841, went on to become King of England and married Princess Alexandra of Denmark. He is the great-grandfather of Queen Elizabeth II and the great, great-grandfather of Prince Charles. Alice, born in 1843, married the Great Duke Ludwig of Hesse and Rhine, and her granddaughter married the prince of Greece. Alfred, born in 1844, was the Duke of Saxe-Coberg-Gotha and married Grand Duchess Maria of Russia. Helena, born in 1846, married Prince Christian of Augustenberg. Louise, born in 1848, married the Duke of Argyll, John Cambell. Arthur, born in 1850, was the Duke of Connaught and married Princess Louise of Prussia. Leopold, born in 1852, was the Duke of Albany and died young. Beatrice, born in 1857, married Prince Henry of Battenberg. In recent years, genetic researchers have begun to use DNA testing to determine ancestry and understand patterns within a family. Queen Victoria's family tree is no exception. While Victoria herself was not affected, she was a carrier for the blood-clotting disorder hemophilia. This X-linked disorder primarily affects men. In the 19th and early 20th centuries, it often resulted in early death due to uncontrolled bleeding. Several of Victoria's male descendants were hemophiliacs, and many of her female descendants were carriers for the disease. Thought to have originated with Queen Victoria, this single genetic anomaly was instrumental in the downfall of several European royal families. Leopold, son of Victoria, was a hemophiliac and died at the age of 31 after a blow to the head. Leopold's grandson and Victoria's great-grandson, Albert, was a hemophiliac and died when he was only 20. Alexis Romanov of Russia was Victoria's great-grandson and was also a hemophiliac. His disorder was one of the reasons his parents sought the advice of Rasputin, which eventually contributed to the family's murder during the Russian revolution. Beatrice, daughter of Victoria, had two hemophiliac sons and a daughter, Eugenie, who married the King of Spain and had two hemophiliac sons. Their disorder contributed to the downfall of the Spanish royal family.